Are you regularly five minutes late to class? What about that god-awful 10 minute passing period from one side of campus to the other? Do you remember when your class times actually made sense and, you know, didn’t contradict the rest of the scheduled world? Yeah, it pisses me off too — and we’re not alone in that. Fellow students have expressed their frustration, such as first year 3D Digital Design major Dustin Correll, who has midday classes that alternate between starting at 12:20 p.m. and 12:30 p.m. This subtle difference in starting times has made him late to his 12:30 class on multiple occasions. Sound familiar? 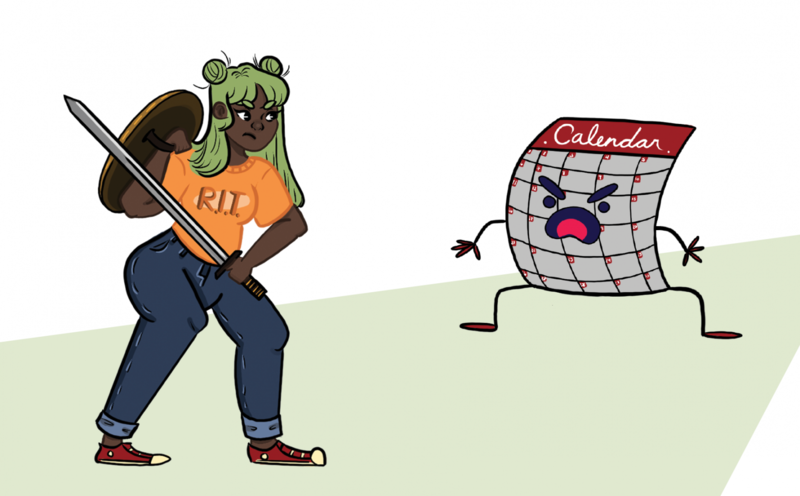 Even students who aren’t necessarily against the new time system — like second year Animation student Kate Quesada — find the schedule to be “weird,” and although Quesada has said that while getting an extra 15 minutes in the morning doesn't bother her, “it’s bizarre.” We all know RIT has had a long history of daring to be different, but this is a change that’s just a little too much. Not only that, but service providers for deaf and hard-of-hearing students have been put under an additional amount of strain, even for those with years of experience like Wendy Wheeler, a real-time closed captionist, and Gina Coyne, once a captionist and now an interpreter, who have been providing service for 14 and 23 years, respectively. "Professors are constantly asking me, ‘What time does this class go until?’” Wheeler said, proving everyone’s inability to keep track of the seemingly random start and end times for classes. She continued to voice her frustration with the short transition times as well. She often has to rush to put away her equipment while the next interpreter is setting up for the incoming class, hindering the flow of class transitions. Wheeler also expressed concern with NTID students having difficulty in making it across campus from the main NTID building to academic side in between their courses — something that has already been a problem, even before the months of horrible winter weather sure to come. “Not starting on the hour, the 10-minute transition and five-minute longer classes have caused an uncomfortable pace this semester,” Coyne added. Both Wheeler and Coyne have found that the availability of service providers has been limited as well, with meetings and special events starting and ending just off of class times. While Wheeler stresses that she, along with the rest of her department, have been rolling with the punches, a class schedule that matched with the rest of the campus' timing would be much appreciated. Across the board, there is a wide consensus that although the current time system is not intolerable, it sure is adding a level of stress and discontinuity between classes and, well, everything else in our lives that runs on a schedule. While we appreciate the fact that this is RIT’s first foray into this new schedule and New York state laws dictate how much time must be spent in the classroom — which is what began this fresh hell — I feel confident in saying that we’re all looking forward to a class schedule that’s a little more sensible again. Hoosier. Rice-Cooker Afficianado. Plant Thief Extraordinaire.